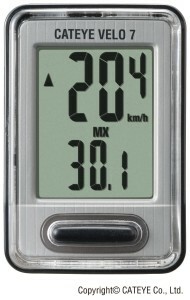 A cyclometer, also known as a bicycle computer, is a small electronic device attached on a bike that enables you to track and measure your performance while cycling. Ever wanted solid proof to brag about the long distance cycling marathons you took or about your endurance and speed on the wheels? A cyclometer lets you do that by recording and storing all the information you may ever need about your cycling adventures. Any serious biker has a cyclometer mounted on top of its bicycle, but we were surprised to find there is a lack of information online regarding which cyclometer is the best or what to look for when purchasing a cyclometer. Hence we decided to make this top 10 best cyclometers list to assist you in finding the best cyclometer for you and navigate among the sea of various cyclometers reviews. We’ll start with a quick comparison table of the highest rated cyclometers, followed by in-depth reviews for each model. CatEye Strada Wireless bike computer is our top pick for the best cyclometer. With a minimalist design, simple and thin yet easily readable, this cyclometer is the easiest way to start recording data about your bike trips. With no need for wires to install or connect it, this wireless cyclometer works with any bike model and provides all the features you would need from a great bicycle computer. 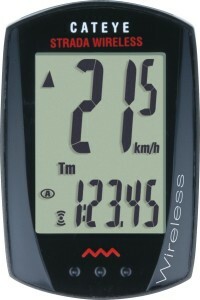 Some of its key functions include the ability to record your speed, both current, maximum or the average, speed range, distance traveled for 2 trips at the same time, as well as the total distance traveled, a clock and an auto power off feature to save you battery, everything transmitted through its wireless sensor. Not only that, but it comes at a very affordable price of around $40 from Amazon if purchased through our discount link above and overall is our top rated cyclometer. 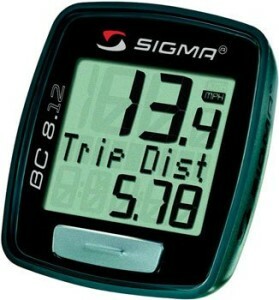 Sigma BC 1009 bicycle speedometer is a wired cyclometer suitable for casual bikers and easy rides. It features all the functionality beginners need, such as measuring a trip distance or the total traveled distance and recording the average speed as well as the current and the maximum one. This cyclometer has a low battery indicator and it’s water proof. 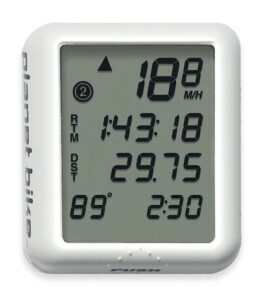 Like the best cyclometers on the market, it features a clock and is able to keep track of the total time spend riding. 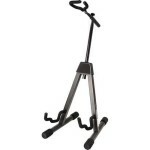 Being available at a very affordable price, this is an ideal choice for an bike enthusiast. 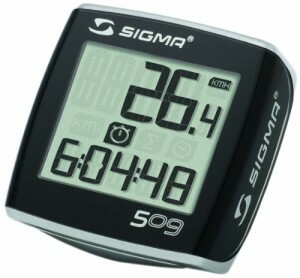 Sigma’s The Classic Bike computer, also known as the model Sigma BC 509, is the ideal cyclometer for a beginner. For starters, is the most affordable cyclometer on our list, being available for purchase for just $10 from Amazon if our above discount link is used. Second, it has all the basic features a cyclometer needs, without any of the extra whistles and bells that just confuses you. It has an automatic on/off function including a scan mode and it’s compatible with any bike training software due to its PC link. A large, easily read screen displays the basic measurement such as distance traveled and speed. CatEye’s Velo 7 Bike Computer is one of the highest rated cyclometers on Amazon, with an average rating of 4.6 out of 5. It features an extra large display screen and is able to provide some additional functions and features not supported by the other cyclometers, such as an odometer and a calorie consumption measurement. 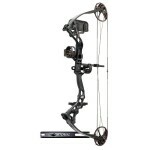 Comes pre-programmed with tire sizes, so you can set it up even easier. Features all the basic functionalists of a great cyclometer such as speed recording, distance traveled and has a high decreed of accuracy in its measurement. Schwinn 20-function bike computer is an affordable cyclometer that tries to do a little from everything. Price is its main attraction, costing just $15, slightly more than our cheapest cyclometer above, but still negligible. It’s 20 functions is able to record virtually everything about your workout, from speed to calories burned. The display screen is backlit for easy viewing even during night time. Planet Bike Protege 9.0 Bike Computer is an extra large cyclometer featuring 4 rows of data on the screen for maximum efficiency. Although a little bit more expensive than the other cyclometers reviews, the Bike Protege model has been ultrasonically welded to be immune to any weather conditions and its backed by a lifetime warranty. Its 9 functions include a dual odometer, speed comparing, ride time and many more in addition to the basic recordings performed by any cyclometer. Sigma BC8.12 cyclometer is a slightly more advanced model than the previously 2 we reviewed with a couple of extra functions, and still a solid purchase. 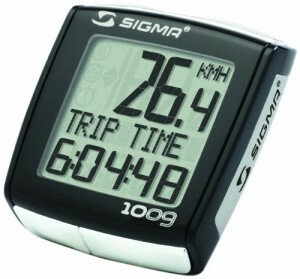 This cyclometer is able to record the speed and distance you travel and keep track of the total time, average speed or maximum speed during the trip. 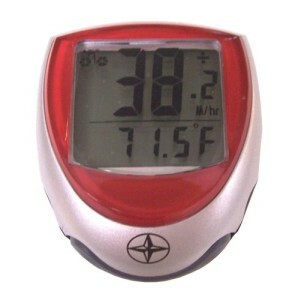 The display screen is easy to read and installing and configuring the cyclometer is a breeze. This is a high quality professional cyclometer, but its high price tag attached was a definite factor in its relatively low ranking on our top 10 best cyclometers list. 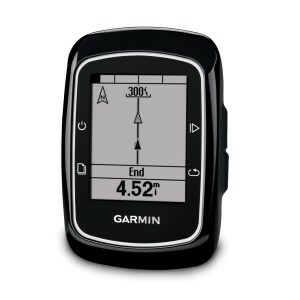 The Garmin Edge 200 is a GPS enabled cyclometer, that makes the process of installing it a simple task. Just mount it on the handlebar and this cyclometer is ready to go, no need to connect any wires or setup any tire sizes. The design is cool looking and modern with an impressive display, but the price tag is an issue for those on a budget, being available for purchase at over $100. 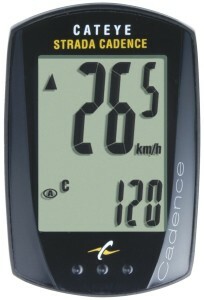 Another CatEye cyclometer, the Strada Cadence bike computer functions basically like a tachometer and is able to perform basic measurements such as current, average or maximum speed recording and the total distance traveled. We feel that for a cheaper price, the other cyclometers can do the job just as well, but those looking for just a little extra, this cyclometer is a great choice. 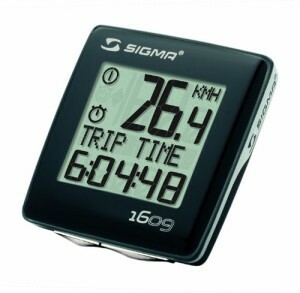 Sigma came up with their own cadence speedometer, the BC 1609 model, which is a wired cyclometer ideal for beginners or training cyclists. It has a couple of nice to have features working for it, such as the PC compatibility, the temperature display and the capability to adjust to two different wheel sizes, and it’s overall a highly recommended cyclometer.